Probably the fastest leading edge discriminator available today. 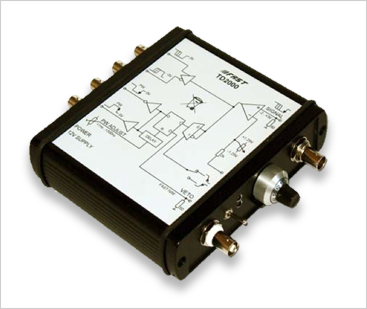 The unshaped outputs can be used at rates in the GHz range (ref. Fig 3). A fast NIM VETO input provides for inhibiting the shaped outputs. The fast NIM outputs exhibit fall times of <200ps. 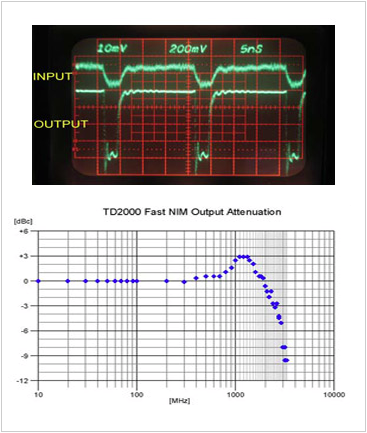 The shaped fast NIM output has a minimum pulse width of typ. 750ps only. Even the positive output has a fast rise time of approx. 500ps. Thus, pulse widths as low as 2ns can be achieved at full amplitude.